Hoarseness is a common occurrence among adults of all ages. It generally describes abnormal voice changes characterized mostly by gruffness or hoarseness, often with changes in voice volume and pitch. You basically want to talk, but it’s difficult to do so, so you end up speaking rough and in a low, barely audible pitch or a high pitch, but with a similarly rough voice. Loss of voice can also occur and is frequent. While it may not sound as much, throat hoarseness is quite a challenging condition which can negatively impact one’s life. Imagine you’re at work or at school, or enjoying a nice night out with your friends. Normally, discussions ensue and you want to pitch in too. But when you talk, your voice sounds broken, either abnormally rough, like a manly man’s voice, or embarrassingly high-pitched and strangled. Hoarseness is both a challenge to deal with and a potentially serious medical condition. What is throat hoarseness all about? Throat hoarseness basically affects your vocal cords and may cause them to get inflammed, hence the difficulties experienced when speaking. The condition may have a number of underlying causes. Fortunately, most of the time they are benign, harmless. Moreover, hoarseness often resolves by itself, but the use of natural remedies can contribute to a significantly shorter recovery time and constitute a good prevention method. 1) Laryngitis. The condition is characterized by an inflammation of the larynx and is a main cause for throat hoarseness. Actually, hoarseness, difficulty speaking and even loss of voice are common symptoms of laryngitis. Talking or shouting too much or any other form of excessive voice use, acid reflux, infections of the respiratory tract, dry air, pollution, etc. are all common causes of laryngitis and can and often will lead to hoarseness. Once the condition is cured, the hoarseness will disappear. 2) Shouting, singing or talking too much. Basically any form of excessive voice use is a benign cause of hoarseness. Singers, teachers and salespeople, for example, are far more likely to experience the condition rather than individuals with professions that do not imply overuse of their voice. In such cases, hoarseness can often be associated with partial voice loss or low voice. 3) Polyps, cysts or nodules of the vocal cords. While it may sound terrifying, know that these types of things can be benign occurrences and while you should go see your doctor if the hoarseness persists, do not be alarmed from the start. Nodules, for example, may rapidly and significantly swell as a result of an infection, but will resume their normal size once the immune system will have fought the pathogens at the site of the infections. However, a checkup is in order. 4) Acid reflux. Gastroesophageal reflux, or acid reflux, causes stomach gastric acid to go up the respiratory tract and burn or irritate the sensitive mucous membrane and even the vocal folds. This can be a silent condition, meaning you may not notice it happen to you, or it can cause you great discomfort through symptoms such as burning sensation in the chest (heartburn) or esophagus, wheezing, coughing, burping, belching, sore throat and hoarseness due to the acid irritating sensitive mucosas. Some people describe it as having a lump in the throat, difficulty swallowing or sensing mucous deposits in the throat. Taking antacid medication, eating at least two-three hours before you lie down in bed and limiting your alcohol, coffee and fatty foods consumption can help manage acid reflux and treat hoarseness (read 6 reasons why coffee is bad for you). 5) Smoking. Any type of smoking, whether it’s first hand, second hand or even third hand smoking, can cause hoarseness, depending on how sensitive a person is. Cigarette smoke as well as other air polluting substances irritate the throat, vocal cords and overall larynx, contributing to the condition. Hoarseness is often encountered in smokers and while some develop it early on, for others it may take a few years for the condition to install. But it eventually will. While hoarseness as a result of smoking might not seem a cause of great concern, remember that smoking is a leading cause of throat cancer. Also, most studies investigating the causes of various forms of chronic disease have made a connection between smoking and cancer (throat, mouth, lungs, etc.) as well as cardiovascular disease (myocardial infarct and stroke). 6) Allergies. Pollen allergies as well as certain mild food allergies trigger hoarseness. When we breathe in allergens such as plant pollen, they stick to our respiratory tract, causing our immune system to overreact at the site of contact. Our immune system attacks allergens, but it does so in such an aggressive manner that our own cells end up being caught in the crossfire, hence the irritated mucosa and the hoarseness. 1) Avoid cigarette smoke in all its forms: first, second and even third-hand smoking. 2) Rest your voice. Take a several day break from singing or talking to allow your vocal cords to recover. 3) Stay hydrated. Drink plenty of water to keep the vocal cords mucous membranes moist. This contributes to a faster recovery time and will even help ease more unpleasant symptoms such as sore throat pain. 4) Avoid coffee, caffeinated drinks, alcohol and fruits rich in tannins, all of which dehydrate you and dry out the already sensitive mucous membranes. 5) Eat honey. Acacia honey, which is the least allergenic type, will help create a protective layer over the inflammed mucous membranes at the level of the respiratory tract as well as act like a local anti-inflammatory. 6) Herbal teas. Drinking tea can be very helpful for treating hoarseness. Not only does it keep the area hydrated and moist, but its warmth has calming effects on the irritated mucosa. Chose herbs with anti-inflammatory and soothing effects (ginger, for example). You can find more information on the benefits and side effects of your favorite medicinal plants here. 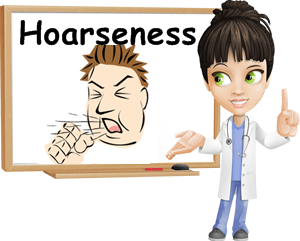 For most people hoarseness is more of an annoying, rather than dangerous condition. However, if you are suffering from severe allergies and asthma, do not take it lightly as a dry, irritated throat can easily lead to laryngospasms and asthma attacks. Conclusion. Taking care of yourself by resting your voice and keeping hydrated as well away from irritants such as pollutants or cigarette smoke can help ease symptoms and relieve hoarseness in a matter of days. Herbal teas also help immensely in keeping your throat moist, soothing irritation and relieving inflammation, all of which contribute to a faster recovery.